Summary: After pasting an oEmbed URL into the "Insert from URL" portion of the Add Media Panel, tabbing away from the URL field does not provide a clear indication of focus. Further tabbing shows the focus was on the preview after tabbing away. 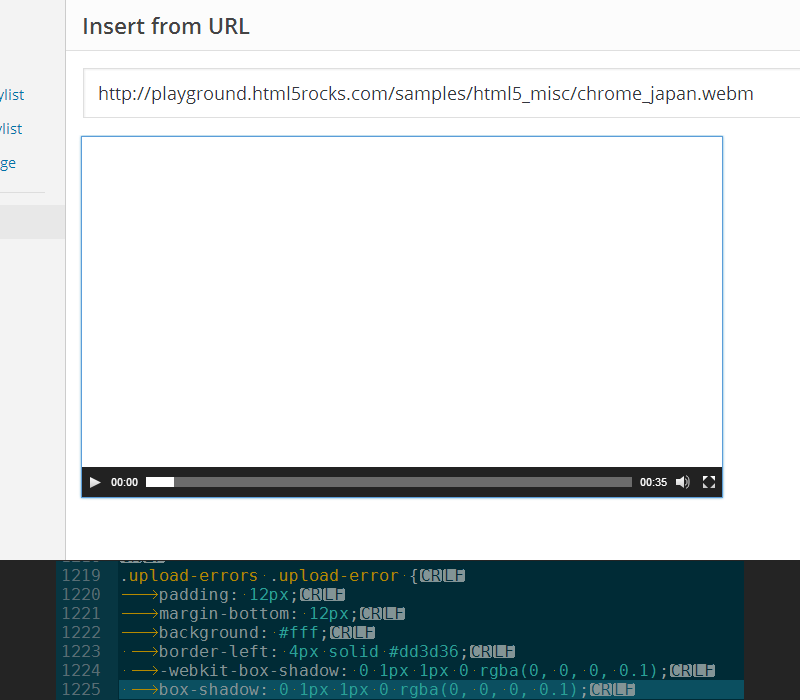 I've replicated this using both YouTube and WordPress.tv embeds. Attached is a screenshot showing the view after tabbing from the URL field. focus-on-yt-preview-unclear.png​ (130.7 KB) - added by philipjohn 5 years ago. focus-on-flickr-preview-unclear.png​ (124.3 KB) - added by philipjohn 5 years ago. 28820.patch​ (546 bytes) - added by afercia 4 years ago. Screen Shot 2015-02-27 at 5.09.43 PM.png​ (88.2 KB) - added by wonderboymusic 4 years ago. 28820.2.patch​ (1009 bytes) - added by afercia 4 years ago. 28820.3.patch​ (950 bytes) - added by afercia 4 years ago. 28820.4.patch​ (1.3 KB) - added by afercia 4 years ago. In hindsight maybe I should have just added this to #23560 as I've also found that focus isn't great on Flickr embeds either (screenshot to follow). This ticket was mentioned in IRC in #wordpress-ui by philipjohn. ​View the logs. I'm not sure if we can do much here, as the focus enters the 3rd-party embed. 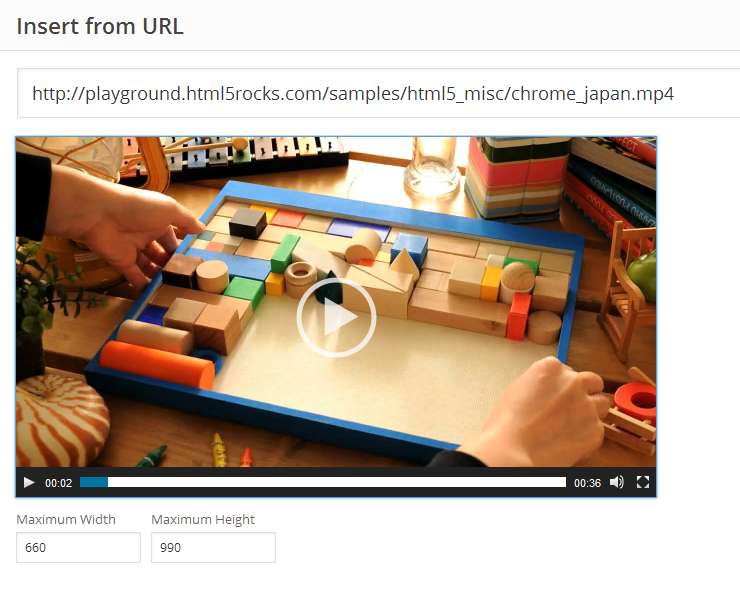 For Youtube videos using the html5 player, there is an indication of focus (though it isn't great). Proposed patch fixes at least the linked image case (e.g. Flickr). Attached screenshot of focused image with patch applied. I'll commit that, it helps. In the Insert From URL state of the Post frame, add the necessary CSS for focus styles for images. @afercia: Would you mind taking a look at this and figuring out what's left? Seems like the experience focusing just about any media in this context isn't great. @drew: when embeds are rendered with MediaElement.js maybe we could try to override the focus style though maybe MediaElement.js should really provide its own, improved, style for focus. See attached patch and screenshots. Maybe the overrides should be moved to wp-mediaelement.css. For embeds rendered in iframes, as @celloexpressions pointed out, the focus enters the 3rd-party embed. Not sure, maybe we could try to inject some CSS in the iframe? and try to target focusable elements (if any) with :focus. Some embeds don't even have focusable controls, for example Ted.com. When 3rd parties provide their own flash player then I'm afraid it's up to the different flash plugin versions. The ActiveX version handle focus better, given that the 3rd party player actually takes care of handling focus. The NPAPI (PepperFlash too) version has well known issues with focus (since years and years...), not sure why sorry I'm really not an expert when it comes to flash. For example the wordpress.tv embed in IE works pretty well but with the NPAPI plugin in Firefox or PepperFlash in Chrome it's impossible to move focus to the flash player controls. Refreshed patch changes "FF" in "Firefox" in a comment and removes a prefixed property, as per Slack conversation. @afercia: Could you just outline for us exactly what improvement/change we're looking to see in applying the patch here? It's just not really clear what we should be testing for before and after. the previews will be rendered with MediaElement.js, then tab away from the input field and keep tabbing. See the focus style differences before and after. The focus styles are definitely improved with 28820.3.patch​. Moving for commit consideration. Should we send focus styles upstream to MEjs? Why yellow for the focus style? Do we need to account for any other embed types? The YouTube example is still unclear to me, for instance, although I don't know what exactly is focused in the one tab stop that doesn't show anything. As I noted before "maybe MediaElement.js should really provide its own, improved, style for focus". Just because it's the default in other players, e.g. flash video players, with dark backgrounds. 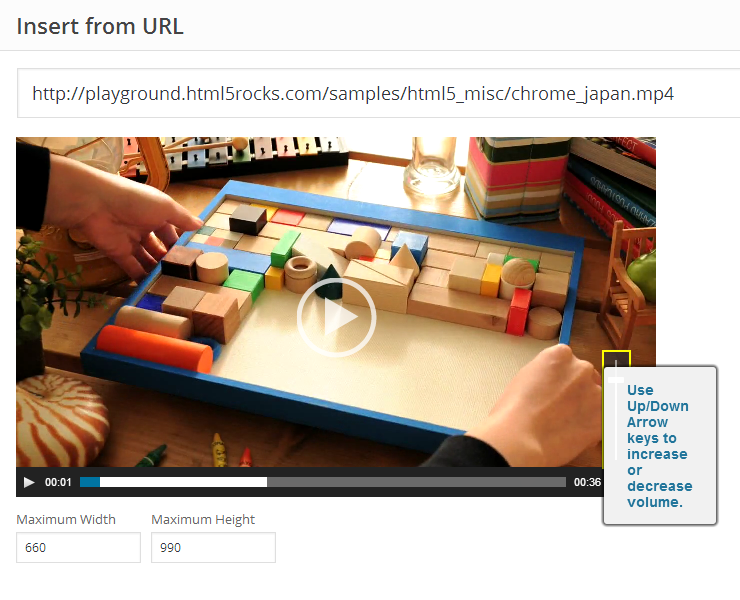 Current patch doesn't touch embeds rendered inside iframes, so Youtube embeds won't be touched. But as you noticed, with these kind of embeds (which are real "oEmbed") the problem persists, focus isn't clear. Only Webkit will sometimes, depending on cases, apply its default blue outline. Let's contribute upstream to MEjs - glad we fixed the image case, but going to punt on the rest of this as I'm not completely clear on what should be done in core and what else still needs fixing. Refreshed patch keeps just the focus style for the embed container. Anything else should be reported upstream, namely focus style for MediaElement.js. Please notice the patch also removes some mixed space+tab characters, this is done automatically by my editor. See screenshot below. While it's a small thing, taking care of focus style is always an improvement. Would recommend for commit consideration.